"Lord V" macro technique: hold both the camera and the pole with one hand. I have tried this and it does help. Thanks, good tips. This post might become a repository for others. In other order I did cut the center column on my Sirui T-025 with the grand savings of about 25g. Now it looks exactly as the new version T-025x with the short center column. I think it did gain significantly in stability in windier situations but at a total of 780g (the C-10 head is 190g) is heavier than I want. Getting rid of the last 3 segments (out of 5) will get take off only ~ 180g, pretty lousy to really worth it. The FLM and Feisol are my best choices with possibly the Platypod also, depending on how easy is to mess with those screws to get somehow level. Personally, I don't anticipate ever trying to go lighter than the 2.75 pound full-height set-up I have now: Feisol 3442, no center column, Arca-Swiss p0, Sunwayfoto screw clamp, and the center plate hook and set of 2 hex wrenches (those L shaped things). It's a real tripod that handles everything but the heavier supertelephotos. But I am not trying to scale mountains with winter gear. I'd rather lose 2 pounds of fat to compensate. Armand, have you looked at these? Just got an email on them. They seem to be new. Looked good until I saw the weight, the lightest is 2 lbs (910g). The Gitzo 1541T is my go to most of the times unless I want to save weight and then I take the smaller Sirui. The Sirui T-1205x I left in a trip and missed the deadline to return it. There is nothing wrong with it but the main thing it has on the Gitzo is the most compacted weight as it's not that much lighter; it will fit on the bottom of a backpack when I'm travelling and don't want to advertise that I have cameras with a tripod on the outside. So bottom line I need something that's clearly lighter than my current combo at 780g, roughly under 450g. By going with a hefty table tripod sized one I should be gaining in stability for windy conditions also. Another tripoholic! We could start our own chapter of Tripoholics Anonymous. Feisol 3442 with Arca p0, Feisol 3472 with Arca Z1, Manfrotto 055B with Manfrotto 410 geared head adapted to A-S plates (my first tripod, and a good one for out of trunk use), Benbo bent-bolt tripod (heavy aluminum thing but once you get the hang of it you can make difficult angle shots) and the Z1 taken off the big Feisol, and Induro monopod with tilt head, and lastly, some awful cheapo tabletop tripod. And a handy but heavy (8 oz, plus 1 or 2 oz for generic nylon strapping to attach it to pack) made-for-tripods roll-top stuff sac with daisy chains and d-rings by f-stop gear. This last item does hide your full-sized 8# tripod from view, but it is overkill for small tripods. If I had a sewing machine, I would run up a small version out of lightweight ripstop nylon for the Feisol 3442.
suggestion - remove 2 or 3 bottom sections from the little Sirui. the bottom 2 are too flexible to support much of anything. i suggest this because i don't think there is a 2 section lightweight carbon fiber equivalent. This may be an irreversible modification unless you can find rubber tips that are the right size for the remaining bottom section. i've as many tripods as you do (doesn't every photographer) - not counting the table tops (i've given up carrying tables around) and come to the conclusion that the little 4-section Sirui is about the minimum that will work as a real tripod (although i haven't added it yet as i'm not back packing long distances and it's not that much lighter than my Feisol w/short column). If you're not carrying a table, i think the short tripods have limited usefulness (that said, i once took a class from a professional that used limited ISO cameras, carried a tabletop pod on on camera all the time and was very creative finding things to support it). The reason we have so many tripods and heads is that outside a studio (and without an assistant to carry them) is that they're all flawed in one way or another. Cullmann Magic. It folds flat to about and 1.25 inches thick, and stores in the laptop slot. It maybe limited in some articulations, but when hiking the basic is all I need. Converts to chest and mono pod as well. Except for putting my self into a picture I do not see the need for carrying a tripod. I carried an F3 with a 24/50 Zoom (and lots of real film) back in the day. But with modern Image Stabilization and Sensor Gain Circuitry giving absurd ISO levels why bother? Photographing landscapes, architecture and especially macros, I always use a tripod. It not only allows for sharper images but gives me time to contemplate composition. Panning through various axes often suggests (even slight) corrections and improvements. A tripod also allows for quick switching image orientation by 90° without major repositioning of the camera. I often take photos in both orientations to meet varying application demands. That’s why I absolutely require a tripod collar on as many lenses as possible. And that’s the reason I never bought the Zeiss 100/2 macro (no collar!). The greatest advantage tripods offer me is to slow down my photography. Naturally I don’t lug one along when takes photos down town. That’s why I absolutely require a tripod collar on as many lenses as possible. And that’s the reason I never bought the Zeiss 100/2 macro (no collar!). When you hit certain points of time, or are trying to do certain things, the tripod definitely helps. I can generally get acceptable sharp photos hand held, but there are different situations (Sunrise, Sunset, post sunset, under dense foliage, etc) that just flat out make it much more valuable to carry a tripod. Last backpacking trip (ok, for the record, only full backpacking trip) was under dense foliage in summer. Mid-day, with a stabilised camera, I still had to shoot at ISO 1600 to get acceptable sharpness while hand held. Yeah Peter, I've still got one (similar to the current models) in the basement somewhere which I used on my (analog) Minoltas. Given a choice, I'd still prefer the tripod collar. On lightweight short telephotos, the camera/lens center of gravity is still pretty close to what it would be with a lightweight pancake lens, and using an L bracket to support the camera/lens won't put significant stress on the lens mount. I want a lens collar on the long telephotos - helpful for the 180 to 200mm 1.2 to 1.5 kg lenses - not as much of an issue for the dainty 70-200 f/4. As for weight-saving, I found that I used the tripod much more when I had an L bracket than when I had just the one camera body plate. I want to be able to switch orientations without having to put the center of gravity off axis, as happens when one uses the 90 degree slot on a ball head. The weight of the L bracket is compensated by the ability to use a slightly less robust tripod. I hadn't thought about the use of nodal slides to place the center of gravity - thanks for reminder, stever. I like using tripods because I do slow down a bit. I feel obligated to putz around with various possible viewpoints using the hand-held camera before whipping out the tripod. I REALLY like using tripods when waiting for animal / bird / insect to arrive at the desired position (a flower, a nest, a place in your anticipated composition) - it's much more relaxing to sit there of minutes or hours with a wired release in your hands, and maybe your hands in your coat pocket if it is cold out. Unfortunately doing this doesn't save much weight. I could very well leave them on and not extend them with the same end result and less headache. If (when) I go backpacking I don't go to take pictures. So I guess it's pa-tay-toe / pah-tah-toe. Seriously! the question was for what type of tripod, not questioning the need to use one vs not needing to use one! Just from expereince, I have to say I never liked any twist style leg lock I have tried. I will take a latch lock over twist every time. Unless its some super crazy hike where every gram counts...I might work out a month ahead of time to keep the latch tripod, or just toss up my hands and take the Cullmann Magic. I've had twist locks grit up from sand. Not good. Give me flip locks every time. 2 section center column and 5 section legs (it's not clear but seems to include a ball-head). Range is 4.75" lowest to 51.5" highest. 3 position leg locks and 13.75" folded. Price is $ 299.99. For some recent backpacking/hiking trips I got this one Pedco UltraPod II and it's working well. Not the most stable but at that level the wind doesn't blow that hard and it's good enough for a mirrorless if you are careful. 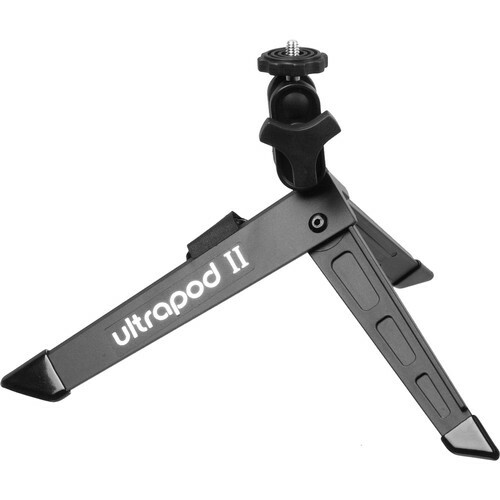 When I'm going as light as I can I just take a little Ultrapod II tripod. It's short for your needs (like the Gorillapod) but it can be easily attached to any pole, tree, or column you have handy. I take mine backpacking and peak bagging and used it yesterday for this sefie. 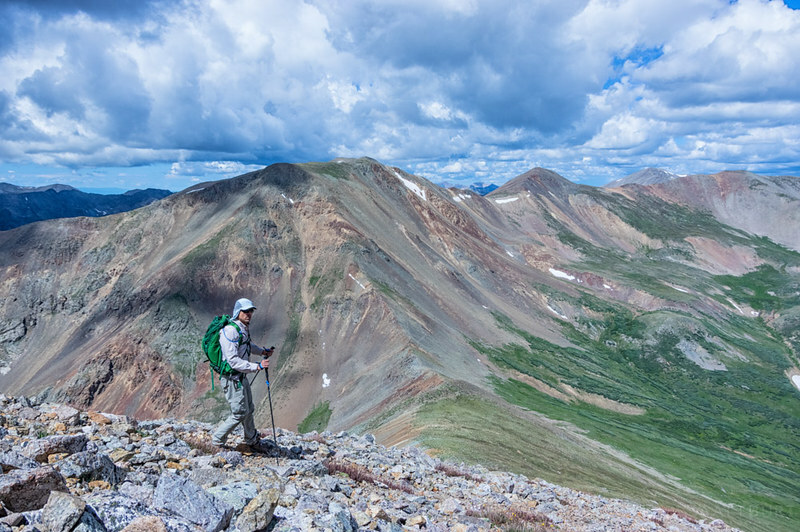 You can make a reasonable taller "tripod" using some trekking poles and cord by attaching the Ultrapod to a pole, lashing the handles together, and attaching or weighting the tail of the cord on the ground while leaning the poles in a A configuration against the cord. Here I just set it on a flat rock on the ground. Super light and under $20! Just don't put a really big camera on it. I'm taking mine to climb Kilimanjaro in a couple of weeks.